Today we were lucky enough to learn from Chelsea once again, only a few months after her last visit and fresh from competing at the Europeans. She kicked off with takedowns. Grab their collar, hand inside on top of the bicep. Lever up bicep arm with your elbow, then drop and grab behind leg (keep your grip on the collar). Drive your forehead into their floating rib, then move on to 'run the pipe' by spiralling them down to the mat. Keep you ear into their thigh. Up next was a de la Riva sweep. Having established a de la Riva hook, get a firm grip on that trouser leg. Push on their far leg, also pulling on the collar. Lift them up a little with your trouser grip. If they are holding your collar, you can switch the trouser grip foot to their hip. Push off, swing your other leg around and lock in triangle. To finish off the triangle if they are hiding their arm, twist their head (chin towards neck leg). Squeeze while hugging their head and pull down for the tap. If they don't grip your collar, you can swivel your de la Riva leg underneath, hooking behind their calf with your shin. Lift, then also swivelling your arm under their leg, do a technical standup (make sure you keep your other foot pressing into their other leg until you're in position). The leg should be on your shoulder. Move back, then kick out their leg to come on top. Chelsea also ran through the bullfighter pass, continuing to emphasise that you should never just fall into their guard, or even let them set up guard. Grab the bottom of their trouser legs, knuckles down. You can now do the usual bullfighter pass. Push their legs in, then move around, dropping your shoulder. She looked into passing the knee shield after that. If they get a knee shield in, grip their collar and crush through into their chin, like the spider guard pass we learned last time. 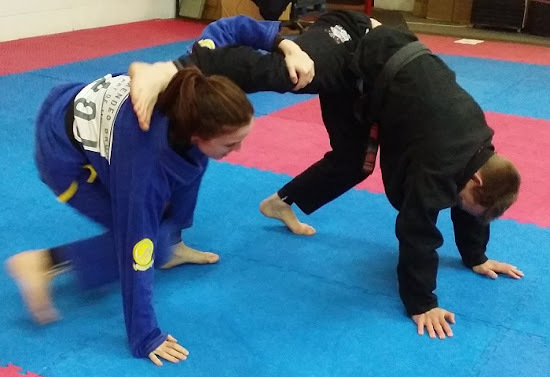 Another passing option is to switch into reverse half guard, facing towards their legs. Chelsea likes to make sure she traps their arm, scooting up towards their head to do so. You can lock that in place by grabbing the gi by their armpit. Walk your trapped foot to their bum, then push their knee off your leg. Drive your knee to the ground, then scrape their leg off with your free leg. Move through into mount Alternatively, hook under their arm and rotate through into a knee slide. For the classic cross choke from mount, get a good grip, staying heavy on that side. As they try to turn, bring your knee up towards your hand. That traps their arm. Chelsea likes to stick with the traditional palm up palm up choke. She brings her elbow up, sliding her other hand under for the orthodox finish. To finish with something entirely unorthodox, Chelsea went through a 'Monoplata', which I've only vaguely heard of before. It was cool to finally see what it actually is! This operates off that same deep grip for the cross choke. The knee is up high, they have their arm reaching up around your back. Bring your leg over their head, fall to the same side as their arm. To finish, pull your knee towards you. It is sort of like an omoplata, hence the name. I found this tough to do with my short legs, but it was certainly nice and tight once you lock it in. Once again, Chelsea and Tom ended the technique portion with an awesome question and answer session. This time, I had some questions about koala guard, which I've been trying a lot, but often get squashed. Tom and Chelsea suggested that you should have in mind either a single or double leg. If you're looking for the single, really drive your shoulder into the back of their knee. If you're looking for the double, stay tight with your head, your ear on their thigh. Also be sure to get a shin-on-shin, so even if they do drive, you can lift and adjust.